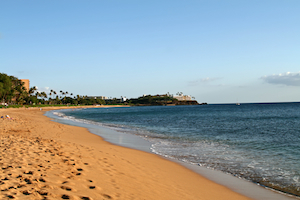 The calm Maui waters at the beach are perfect for snorkeling, paddle boarding, and swimming. Play in the main pool, relax in the Jacuzzi, or hang with the little ones in the kiddy pool. Get your game on at the tennis courts, beach volleyball area, and putting green. Plop down on the couch in your rental after a long day of fun at the beach. Get together for a family meal or gather round for happy hour and live music. Walk to Kahana Gateway for small shops and an excellent meal at Maui Brew Co.
Head downstairs to rent snorkels, boogie boards, and stand-up-paddle gear. Short Walk to Maui Brewing Co.
You have prime access to a calm, kid-friendly beach. There are tons of daily activities from hula classes to arts n' crafts and ice cream nights. If you’re looking for a family vacation rental where you and the kids can make new friends along the way, Sands of Kahana is the resort for you. The resort offers dozens of family activities including hula lessons, lei making classes, nature walks, and its famous “Mix” and “Mingle” gatherings with burgers and mimosas. There are plenty of opportunities to get to know other families during your stay, from beach volleyball contests, to live music events at the resort’s on-site American restaurant. Or keep it low-key and relax at the outdoor pool. Go for a swim or lounge poolside and keep an eye on the little ones splashing in the children’s pool. Have a family cookout thanks to the BBQ grills. Let the kids assist with condiments and hot dog assembly. Work on your tennis game on the indoor and outdoor tennis courts, or your golf swing on the putting green. For more traditional cardio, check out the fitness center. One- to three-bedroom condos sleep four to eight guests and feature a full kitchen, spacious living room, and private lanai. For groceries, head to Times Supermarket. Surprise the kids with a top-your-own-pizza night. Lay out the dough, sauce, cheese, and toppings and let the little ones go wild. Don’t worry if things get messy; you’ll have an in-suite washer/dryer. Enjoy the pizza while you watch a movie on the flat screen TV with cable and DVD player. Be sure to have the kids pack some of their favorite movies to bring. As an added bonus, you’ll have both weekly housekeeping and wi-fi included in your condo. Offshore, the waters near this Maui rental resort are so gentle that they create a virtual playground for swimming, snorkeling, and stand-up paddle boarding, accessible to all ages. Sands of Kahana is a short walk to Maui Brewing Co. It’s open seven days a week and offers vegetarian, gluten-sensitive and vegan menu items as well as a special menu for kids. Grownups will enjoy Happy Hour, from 3:30 to 5:30 pm daily. Kapalua Golf Club features two championship courses perfect for honing your game. The Bay Course opened in 1975 and has hosted over twenty professional tournaments. It’s most known for their fifth hole, which is the only hole to play over the ocean in Maui. The Ben Crenshaw and Bill Coore-designed Plantation Course was named the best course in Hawaii by Golf Week for ten years in a row. It’s over seven-thousand-yards, is a par three course and is home to the PGA Tour’s Tournament of Champions. The best of Ka'anapali without the crowds – Kahana is a calm family retreat on the beach. You're also right next door to the world-class golf courses and vibrant coral reefs of Kapalua.